Welcome to the Video Tutorials LibGuide! 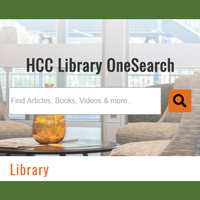 OneSearch Tutorials – With the HCC Library OneSearch tool, users are able to search HCC databases, eBooks, and additional relevant full-text material all in one search. These tutorials provide tips on how to complete a basic and advanced search to find scholarly journal articles, as well as, how to search for print items and books instructors have placed on reserve at the Brish Library and Learning Support Center. Database Search Tutorials This series of database tutorials is designed to explain the features of a variety databases that are useful in locating scholarly information for research assignments Databases discussed include Academic Search Premier, JSTOR, and CQ Researcher. APA Style Tutorial The American Psychological Association (APA) has created a system of citing the sources that are used in writing research papers. This three-part video series provides information on formatting the research paper, creating the list of sources or References page and using internal documentation to cite sources within the research paper. Evaluating Resources Tutorial There are several methods useful for determining if the information found on the internet is reliable and/or useful for your information needs. This tutorial discusses using the 5 W’s to evaluate the websites found when searching the open web. MLA 8 Style Tutorial Has your instructor required that you use “MLA style” for your research project? If so, this is the video tutorial for you. 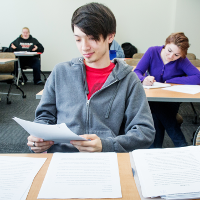 Learn how to use the 8th edition of the Modern Language Association’s (MLA) manuscript style for writing research papers.